By far the most popular jointing mechanism for municipal pipelines is by way of spigot and pipe-end socket which has made PVC the preferred material by consulting engineers, installation contractors and municipal end users. 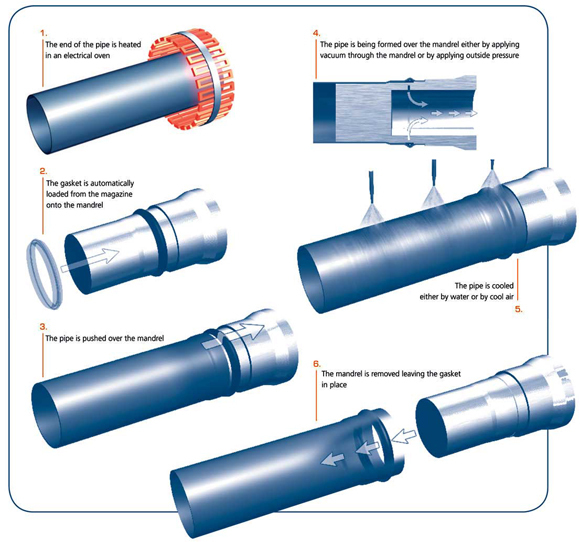 The popularity of PVC pipes can be attributed to the many advantages offered by this sealing system: the ease with which pipelines can be installed at relatively low costs, allowance for angular deflection at joints, allowance for axial movements according to temperature and pressure changes, and allowance for ground movements. Rieber is a generic name used to describe a steel-reinforced rubber seal that is incorporated in the pipe socket during manufacture, making the seal an integral part of the pipe. Being firmly fixed in the pipe socket ring groove, the steel reinforcing provides structural support and pre-compression of the rubber ring against the pipe wall, as shown. The tight anchoring of the seal prevents the ingress of soil and other foreign particles into the sealing zones. The Rieber Platinum seal is the newest generation to be marketed in South and Southern Africa, with special designs for pressure and non-pressure sewer and drainage pipes. The seals are manufactured by S&B Hultec in a world class facility with ISO 9001-2000 accreditation and are exported to over 70 countries around the world. For the pipe manufacturer the socket forming process used with Rieber seals means better and more consistent quality pipe joints especially on the more problematic thicker wall, higher pressure classes of pipe. For the contractor this means improved quality of the installation while for the consulting engineer, proven trouble free performance long-term with no water leaks or water loss and more efficient use of energy, all of which enhances the value of the pipeline for the municipal authority. Europe = 50% and growing. South America = 70% and growing. Australia = 65% and growing rapidly. The Platinum seal is available in sizes from 50 to 1200mm and meets the requirements of SANS/EN 681-1, SANS 966 Parts 1 and 2, SANS 791 and SANS 1601. Steel reinforcement: prevents deformation resulting from temperature changes which may cause problems during assembly. Integrated, part of the pipe socket: always positioned correctly in the socket and cannot be displaced during handling and pipe installation. Locked-in, fixed ring system: no displacement during operation. Pre-compression of the seal in the pipe socket groove: no sand ingress both prior to and during operation. Combined lip and compression sealing components: seals under all conditions of pressure and vacuum. Ease of jointing: no need for excessive force; faster installation. Rieber’s design features provide exceptional hydrostatic strength, preventing the seal shifting during axial and frictional movements in the pipeline. These movements can occur under pulsating pressures caused by water hammer or pressure surges: Rieber’s design features prevent sand ingress and displacement under these conditions. The fact that up to one third or more of potable water is lost in many cities and towns in South Africa represents an incalculable loss of this precious resource as well as the energy used in pumping it. Modern technology integrated, steel reinforced pipe seals, guarantee no leaks long-term, and are thus essential to water authorities and consumers.